Near the town of Kahuku on the North Shore of Oahu, there are quite a few shrimp farms. Some of them allow you to fish for your own shrimp from their ponds, but most are closed to the public. 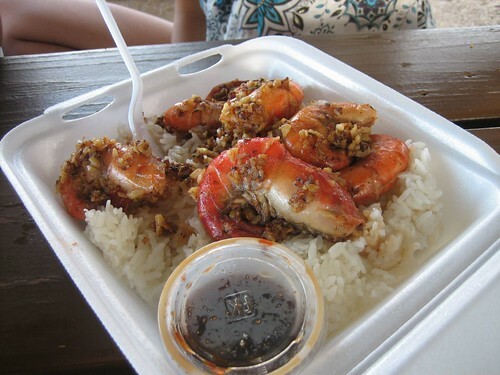 An attraction for surfers and tourists alike are the shrimp trucks around the North Shore and even in Honolulu that serve several variations of shrimp dishes usually with two scoops of rice some greens or cabbage and that wonderful feeling of goodness you get from eating fresh seafood outside on picnic tables after a day at the beach. 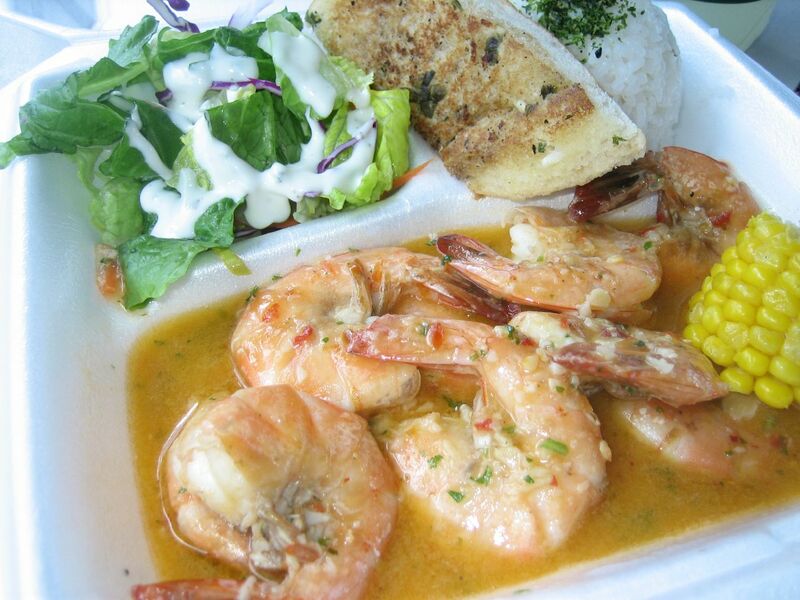 Every truck has its own recipes but all serve some version of shrimp with a garlic sauce. Several months ago, I sampled the two best known: Giovanni's and Romy's. This time I made it a point to try different trucks. 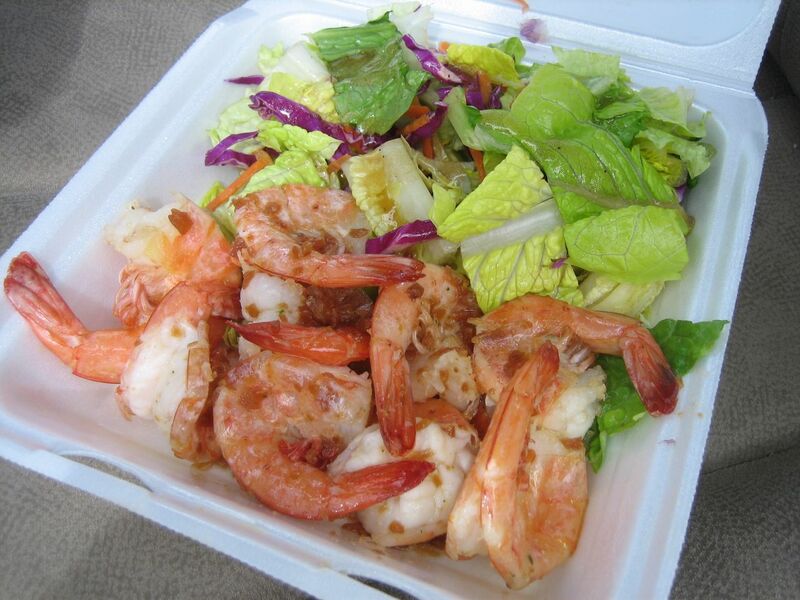 There are two primary components of shrimp truck dishes, one is the quality and taste of the shrimp themselves and the other is the sauce or preparation of the shrimp. In terms of the quality of shrimp my order of preference: Romy's, Macky's, Hono's, Blue Water Shrimp, Giovanni's. For sauce and preparation my preference is: Giovanni's, Blue Water Shrimp, Hono's, Romy's, Macky's. The other popular preparation is the spicy and sweet sauce which is more sweet than spicy. I did not like this at all, strong and sugary red sauce. Like a Chinese sweet and sour sauce with a bit of chili added -- not my taste at all. 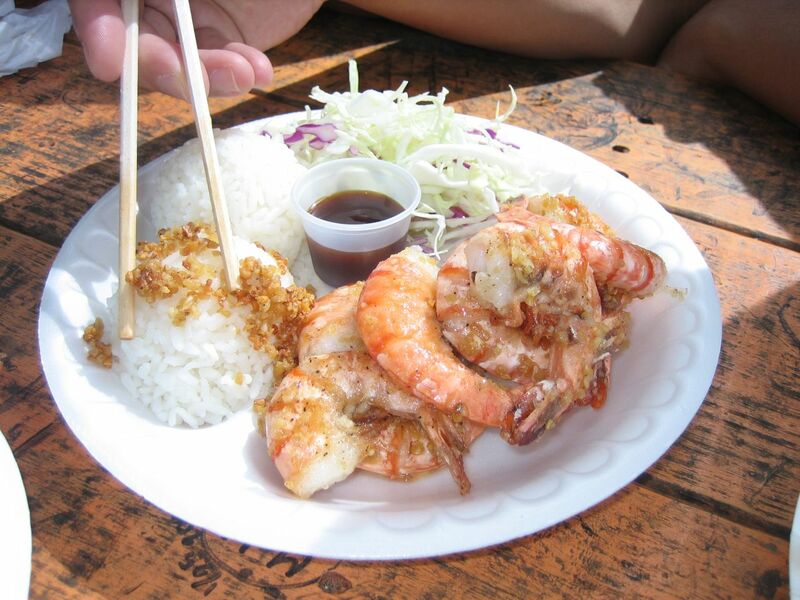 I tried the Haleiwa outpost of Macky's Original Shrimp truck which was near the end of town. They had several picnic tables with a shade above them. I was surprised by the flavor of their garlic butter shrimp. The shrimp were larger than Giovanni's but smaller than Romy's, served cleaned and deveined. They had a very fresh taste and even a natural sweetness to the meat. This sweetness showed through the light garlic butter sauce. I would've liked a bit of acid to the sauce, but liked the fact that it didn't overpower the dish. 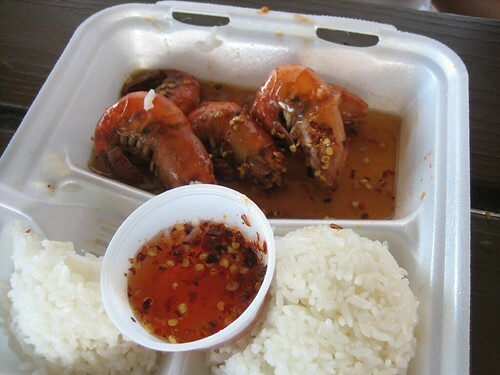 Overall, Macky's garlic butter shrimp was a good balance between fresh shrimp and a light sauce to compliment the shrimp. 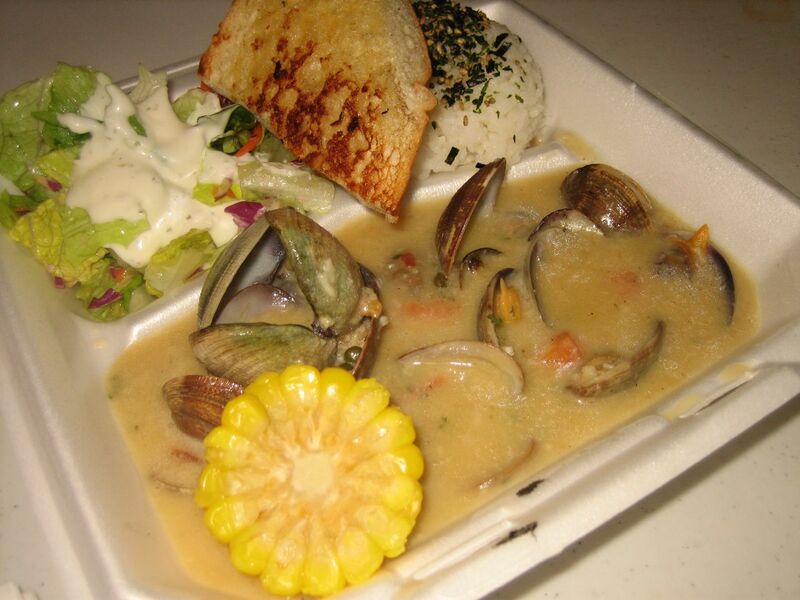 Hono's ShrimpThis truck is located in the corral of food trucks in Haleiwa. The quality of the shrimp here was good, slightly larger than those at Macky's, though not deveined. The garlic sauce was similar to that of Romy's, a simple saute of chopped garlic with a bit of butter, but lighter on the garlic. Another good compliment to the shrimp. Eating this side by side with Giovanni's shrimp scampi, it was clear that Giovanni's sauce is excellent over rice but overpowering on the shrimp. 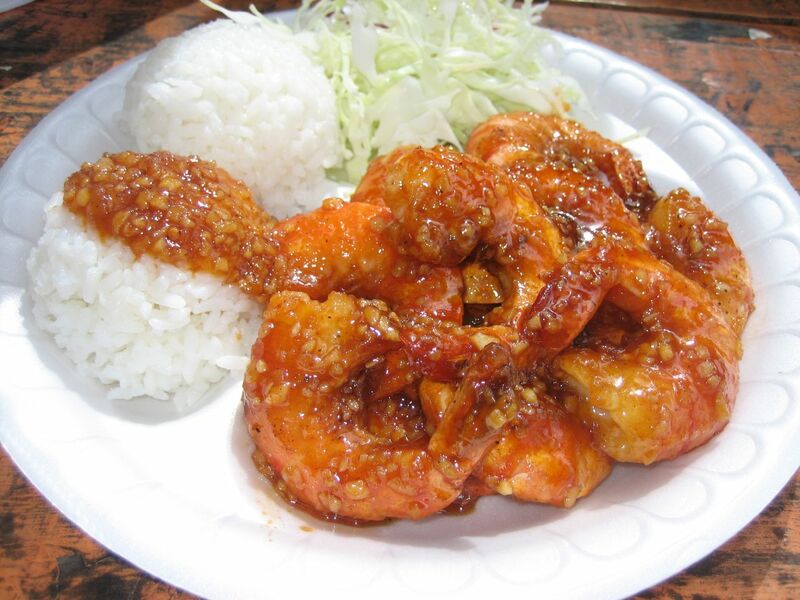 The spicy shrimp was sweet and spicy without being sugary. Again, not to my taste, but better than that at Romy's. Fans of this flavor might like it. 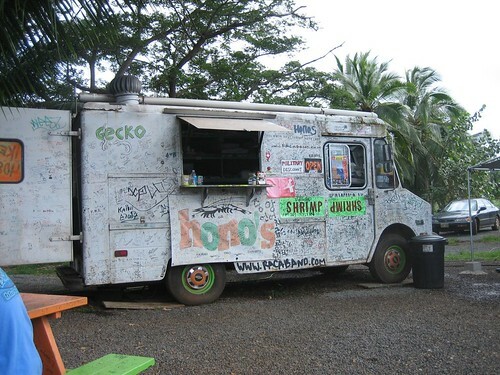 I went to the Honolulu outpost of this truck located on Kuhio in the empty half of a lot under construction. 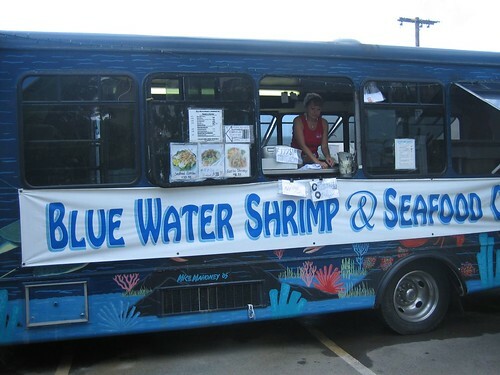 Sharing a covered picnic area with another food truck is the brightly painted Blue Water Shrimp, serving the typical shrimp dishes as well as clams, king crab and seared ahi. 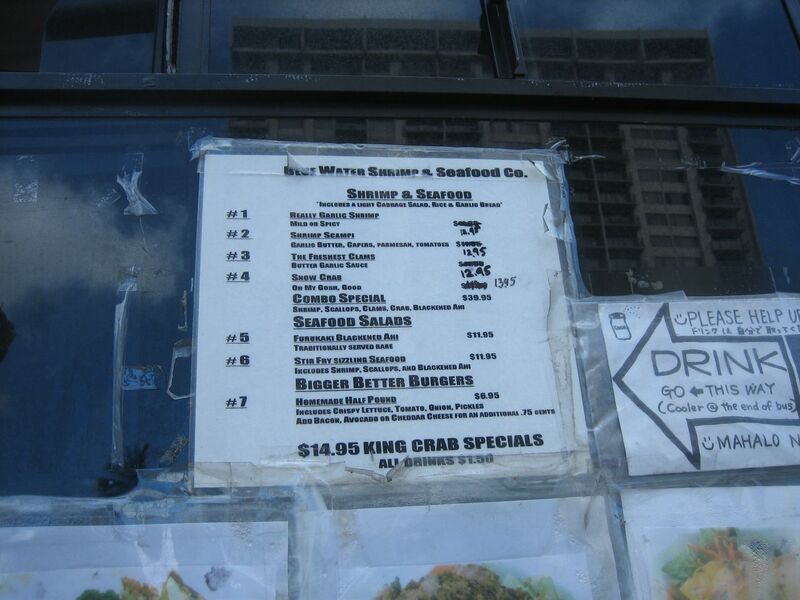 This truck has a larger seafood menu than most and coupons can be found in the Japanese Kau Kau shopping flyer. 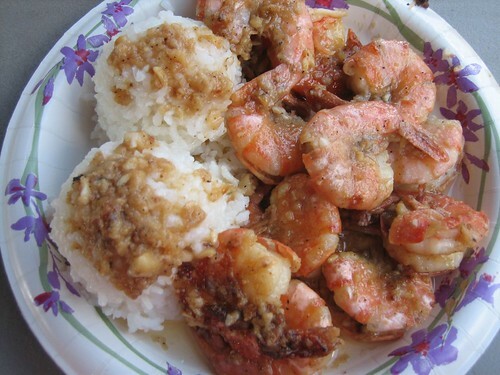 We sampled the very garlic shrimp (spicy), shrimp scampi, clams, and seared ahi. I was not impressed by most of these items. The saving grace is the very garlic shrimp, which I ordered spicy. The shrimp was good quality, eight to ten shrimp on a plate, some of them deveined. It was, however, the sauce that was the most prominent flavor in the dish. It was a thick, buttery sauce balanced with lemon and mixed with some chili pepper. It was so tasty that one of us mixed in the rice and saved his shrimp to eat later. I agree the very garlic sauce is powerful, more buttery than Giovanni's, but less salty. The combination of the spice and butter made me return twice for more. Last notes, I would not order the scampi or clams again, they had similar thick sauces of butter and parmesan. The sauce was bland and completely coated the shrimp and clams. It reminded me of soup served at a cafeteria. I actually wanted to rinse off the seafood to eat it without the sauce. 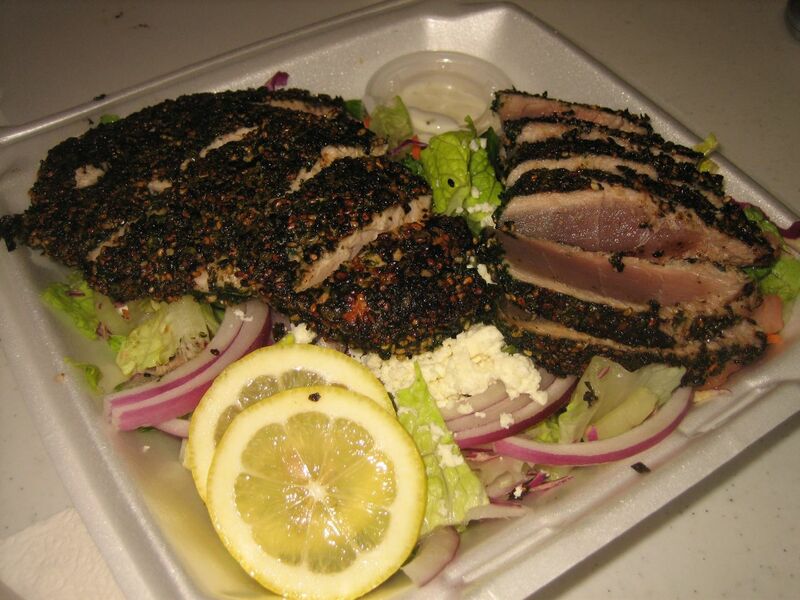 The Furikake Ahi is just o.k., a huge portion enough for two. Would order that again if not in the mood for shrimp. Beware of the parking, I suspect that the apparently unattended parking lot actually has an attendant lying in wait.